Perfectly divine, this darling dog will capture every heart in the room on this delightful Great Dane Paw Wipe Towel. Your beautiful hairy companion will astound on this 13 x 18.5 inch machine washable towel finely made from White Terry Cotton. It also comes with a Hook & Grommet for hanging anywhere in your home, car, boat or any place that you bring your best friend. 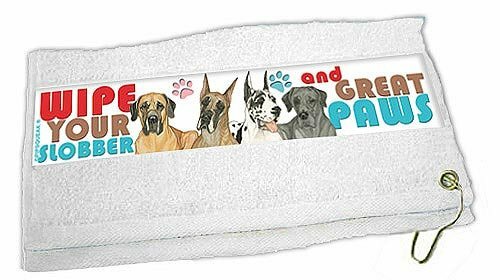 Our Great Dane Paw Wipe Towel is an adorable gift idea that friends will be excited to use for several years. Makes for a fun and useful gift for any lover of this great breed. View More In Grooming Wipes. If you have any questions about this product by Pipsqueak, contact us by completing and submitting the form below. If you are looking for a specif part number, please include it with your message. SoFetch Large Natural Grooming Wipes - Hypoallergenic, Biodegradable Packaging, Heavily Saturated, Light Fresh Scent, 20ct - Perfect For Dogs That Have Anxiety During Bath Time. Animal Planet 24005 All Natural Lemongrass Pet Wipes, 8" x 7"